Inspired by my favourite veggie side dish, Lime & Sesame Steamed Kale, I bring you Sesame & Lime Broccoli (photo taken chez cottage by candlelight)! We needed a green veggie at the cottage after all of our Almond Plum Cake, so I thought I’d try doing some broccoli the same way that I do my kale… and it was divine. Give it a try! In a steamer basket in a large pot with about half an inch of water on the bottom, place broccoli, and cover the pot. Steam for about 3-5 minutes, until the broccoli is bright green. Watch it carefully, and don’t over-steam. 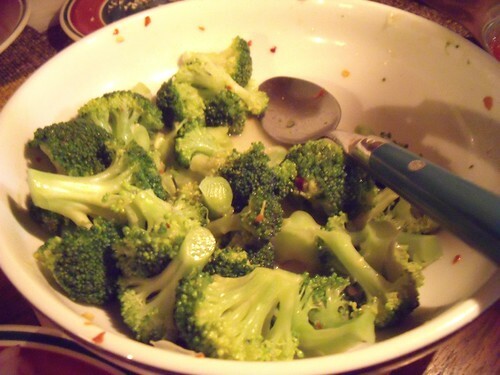 Remove the steamed broccoli from the steamer basket, and toss with remaining ingredients. Tongs are great for this step. Eat and feel virtuous for getting in such delicious greens!